You’re a Canadian businesswoman, let us say, with a brilliant idea for a high-tech startup. All you need is a year in Silicon Valley – time to network, sell the concept, raise capital and gain liftoff. Only one problem: You can visit, but you can’t stay. U.S. immigration officials won’t let you. Enter Blueseed, an enterprise that is the brainchild of two immigrants to the United States, Max Marty from Cuba and Dario Mutabdzija from the former Yugoslavia. They hope to launch America’s first experiment in seasteading, the creation of permanent, politically autonomous floating cities. Although skeptics consider the project impractical and the estimated cost of startup is at least $25-million, Blueseed’s basic plan to convert a cruise ship into a complex that will incubate high-tech innovation has attracted interest and money. To avoid the reach of maritime law, the Blueseed boat would be parked in international waters, 22 kilometres from San Francisco and nearby Silicon Valley, terrestrial magnet for innovators and venture capitalists. “Unfortunately, foreigner entrepreneurs have a hard time getting visas to stay legally,” explains Blueseed’s president, Mr. Mutabdzija, a 32-year-old lawyer who emigrated to the U.S. with his family from Serbia in the 1990s. “A standard three-month work permit does not give you enough time to raise money, network, find talent or do anything significant.” A floating city, operating outside the jurisdiction of the U.S. Coast Guard and American port or immigration authorities – and offering daily ferry boat or helicopter runs into Silicon Valley – could be the answer. If its plans proceed on schedule, Blueseed would acquire and moor its ship by the fall of 2013. Rent would constitute Blueseed’s primary source of revenue from a potential of up to 1,000 tenants, each paying about $1,200 a month. But the company also intends to claim small equity stakes in the businesses it houses. Blueseed residents would simply need a B-1 business visa. Relatively easy to acquire, they permit travel to the U.S., are valid for up to 10 years, and allow overnight stays. The ship would provide the venue for what the visa does not allow – actually doing business on American soil. Blueseed already has at least one deep-pocketed backer. Billionaire libertarian Peter Thiel – co-founder of PayPal – has injected some $500,000 in seed money. It’s one of more than a dozen investments he’s made in innovative startups, some of which (Facebook, Yelp, Zynga, LinkedIn) have become game-changers. In principle, building semi-permanent colonies at sea is less implausible than it might seem. Small cities of people now effectively reside on vast, ocean-going cruise ships. Sizable communities also live for months on off-shore oil rigs, outfitted with basic housing and recreation facilities. And there have been a few attempts at sea-based colonization. Since 1967, for example, a retired British major, Paddy Roy Bates, and his extended clan have occupied the so-called Principality of Sealand, a Second World War U.K. naval encampment 10 kilometres off the coast of Suffolk. Laying claim to sovereign status, the Bates community has adopted all the trappings of nationhood – a flag, a currency, passports and a national anthem. But no state has yet conferred formal recognition. In the early 1970s, Las Vegas libertarian millionaire Michael Oliver imported boatloads of sand from Australia and established the Republic of Minerva – essentially a glorified sandbar – in the South Pacific, near Tonga. Alas, Mr. Oliver’s idyll of an independent fiefdom was quickly shattered. Tonga laid claim to the “territory,” and invaded. But the seasteading ambition remains, and nowhere more prominently than at the San Francisco-based Seasteading Institute, which also claims Mr. Thiel as a benefactor. The engineering issues alone – designing an ecology-friendly, floating city able to absorb the ocean’s wave action and more than occasional storms – are daunting. There are ancillary questions about electricity generation, sewage and a desalinated water supply. Then there’s the potential legal quagmire. A nation’s territorial waters extend 12 kilometres offshore, although many countries claim the right to enforce criminal laws 24 kilometres out, while others claim a 322-kilometre economic exclusion zone. If seasteads became bases for business operations, which Mr. Keenan says they must, they’d be in violation. But even 50 nautical miles away from land is likely too far to maintain logistical supply lines. Also unclear is how seasteads would protect themselves from marauders, pirates and would-be terrorists. Despite the obstacles, Mr. Keenan believes the political vacuum is urgent enough to yield solutions. “We need more experimentation and opportunities for people to live in different ways,” he says. “Let’s try a variety of ideas – libertarian, communist, direct democracy. Most startups fail – and that’s okay. We’ll find out what doesn’t work.” In the meantime, the organization’s founder, Mr. Friedman, may be hedging his bets. He is also CEO of Future Cities Development Corp, which hopes to build land-based urban centres governed by libertarian principles. The first one would be located in a special autonomous zone recently established by the government of Honduras. Mr. Keenan calls this “seasteading on land,” though another word for it might be homesteading. There are some basic engineering constraints that participants will have to heed, as explained both in the call-for-entries and in this forum, and a sample design has been supplied. But I think it’d be absolutely fascinating to annualize this, and launch a kind of eVolo competition for offshore platform design. The skyscraper designs that come out of eVolo might gravitate a bit too strongly toward the biomorphic/diagrid/arbitrary fractal tiling end of contemporary architectural design, but each year’s results are always worth checking out. So if architects were asked to rethink the spatial design of offshore libertarian self-rule, and to do so as part of a high-profile annual competition, what sorts of structures might we see? For a little more background, Wired’s Chris Baker covered the Seasteading Institute last month. Baker wrote that the Institute “doesn’t just want to create huge floating platforms that people can live on,” they are “also hoping to create a platform in the sense that Linux is a platform: a base upon which people can build their own innovative forms of governance. The ultimate goal is to create standards and blueprints that can be easily adapted, allowing small communities to rapidly incubate and test new models of self-rule with the same ease that a programmer in his garage can whip up a Facebook app.” Here, architectural design would actually help to catalyze new forms of political sovereignty. The cultural possibilities for these offshore spaces are effectively without limit – and they would be self-policed, falling outside the bounds of international law. This opens up a number of legal (not to mention moral) quandaries. Some of you may have heard of the Seasteading Institute, which announced its existence with a press release a month ago. Basically, Peter Thiel is giving them $500,000 to get started on building an awesome seastead right here in the Bay Area. Sounds like a great idea, I’d love to visit, but it could take a decade or so until we have hundreds of people living on these things. (Even so, it’s a worthy cause!) I caught up with the Executive Director, Patri Friedman, an acquaintance of mine, and asked him a few questions about this new org. 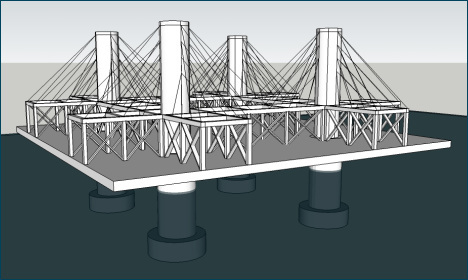 Michael Anissimov: Will $500,000 be enough to build a “safe, cost-effective, gorgeous” seastead? If not, how much will it cost? Patri Friedman: Nope. But it should be enough to do the design and engineering work for a small (bay/coast-sized) seastead, and get our research program started. We think it will cost another $500K – $1.5M to build a nice Baystead. We’ll know a lot more about the costs after we’ve hired an engineer and done some initial design work. MA: How many people will live on the first seastead? PF: It depends on what the best initial application turns out to be. If it looks viable to build small seasteads as replacement yachts (much roomier, safer, and slower), then it could be as small as one family. If the initial business is aquaculture, perhaps a crew of a dozen. If it’s a resort, then more like hundreds. MA: How many people will need to be there before it’s economically self-sustaining? PF: This is tough to answer because seasteads are a form of real estate, so it really depends how they are used. We don’t expect our houses to be economically self-sustaining, after all. I’m also not sure that it’s a good way to evaluate success. If one person lives on a seastead and makes a living telecommuting, that’s technically economically self-sustaining. If 100 people live there as a retirement community, and pay for it with investment income, then it’s technically not economically self-sustaining. Yet the latter would look much more like success to me. I’d rather evaluate success by average population and the number of people who are able to make a living onboard. MA: You say the notion of seasteading will be useful as a testing ground for various political systems, and that’s true, but historically, the concept is associated with libertarianism. Will the first seastead have a libertarian form of government? PF: It seems likely, at this point, since the initial group is mainly libertarians. However, I think it will be quite awhile before seasteads are large enough to be truly thought of as countries with forms of government. For example, the single-family seastead mentioned earlier doesn’t really have a “government” per se, nor does an aquaculture farm with a dozen crew. Even a resort with hundreds of people will most likely be owned and operated by a single corporate entity. That entity will want to have a system for administering justice and resolving disputes, and that system is likely to be pretty libertarian, but I’m not sure I’d call it a government. It’s more like Neal Stephenson’s Franchise-Owned Quasi-National Entities from Snow Crash. I’d say the first place you are likely to get something like a government is when you have the first residential/multi-use seastead (or gathering of seasteads). And that’s far enough off in the future that it could be a different group of people. MA: In 1971, a group of people calling themselves the Republic of Minerva brought sand from Australia and dumped it on a reef until it rose above the water level, creating new land. Why is this not the Seasteading Institute’s approach? 1) It doesn’t scale. Every piece of rock which is above water at high tide is claimed by a current nation (because it extends oil, mineral, and fishing rights). There are very few places where reefs get high enough to make good island bases, yet are low enough to not count as existing land. So there are very few places where this technique works. Whereas if we can make seasteads affordable, there are tens of millions of square miles of empty oceans available for them. 2) It doesn’t take advantage of the ocean’s dynamic geography. We think it’s important for any new country venture to think about why the government will be better than it is on land. The US started with limited government, but there seem to be very robust effects which make small government not an equilibrium for large countries. Modular seastead communities fundamentally change the incentives facing government. Fist, they loweri the barrier to entry for starting new countries. Second, they reduce customer lock-in (since you can leave by floating your home away at any time). Together, this means they are almost guaranteed to make government work better (any government, not just a libertarian one). A new island has no such properties. MA: In a few sentences, summarize how a seastead might get electricity, food, and generate money. PF: Two words will suffice: “Cruise Ship” :). Floating cities are already real – millions of people take cruises every year, and they’re cheaper than the cost of living in some US cities. We have many differences in mind, but cruise ships prove that the idea is possible. Now we just have to make something safer, stabler, more spacious, more modular, incrementally built, cheaper, permanent, and worth visiting even though it mostly stays put! MA: On your site, all the pictures of seasteads show them suspended above the water. Why is this? What if I want to go to the edge and dip my feet into the water? PF: We have two designs in mind. The one you saw uses tall spars to elevate the living space above the waves. This minimizes waterline area which helps disconnect the structure from the waves, making it safer and more stable. We currently believe this is the best shape for a permanent structure in areas with big waves. This is how most oil platforms are designed, after all. If you don’t have to deal with waves, you can just make simple platforms, like hollow concrete boxes. This could be done near the equator (the doldrums), where waves are much smaller. Or for a large community, it could be done inside a circular breakwater. MA: The practice of using a “flag of convenience” is frowned upon politically. Do you plan to use them for your seasteads? PF: Wait, why is making politicians frown a bad thing? Besides, if flags of convenience are good enough for half of the world’s tonnage, they’re good enough for us! Seasteading may be a weird idea, but we think our chances of success are highest if we use as little innovation as possible. Flagged vessels are an existing category in international law which will give us a simple, clear legal status that should get us pretty much left alone. At least, that’s what our preliminary research shows – we have a volunteer who worked on the Law of the Sea treaty negotiations for the US under Reagan who is researching the subject for us. Until the 1960s, Europe had few commercial radio stations. Broadcasting was a government monopoly in many European countries, and listening options were limited to a few staid government stations such as the BBC. But as Erwin Strauss tells it, that changed when enterprising “pirate radio” ships began dropping anchor off the shores of European countries and blasting the latest pop music in violation of those countries’ laws. The governments were not amused, but because the ships were in international waters, there was little they could do. Most European governments began refusing the pirate radio ships access to their harbors, but the ships were able to find harbor elsewhere. European governments finally succeeded in shutting down the pirate radio stations in the late 1960s by passing laws prohibiting their subjects from doing business with the broadcasters—including purchasing advertising from them. But the episode created a political constituency for private radio stations and the broadcast of more pop music. In the UK, for example, private, commercial radio broadcasting was finally legalized in the early 1970s. History has many examples of hierarchical institutions being disrupted by technological advances. The invention of the printing press helped undermine the authority of the Catholic Church. Today, the Internet is undermining traditional copyright industries. An audacious new project aims to achieve a similar result by creating new competition for the world’s sovereign nations. The Seasteading Institute, the brainchild of two Silicon Valley software developers, aims to develop self-sufficient deep-sea platforms that would empower individuals to break free of the cozy cartel of 190-odd world governments and start their own autonomous societies. They envision a future in which any group of people dissatisfied with its current government would be able to start a new one by purchasing some floating platforms—called seasteads—and build a new community in the open ocean. History is littered with utopian schemes that petered out after an initial burst of enthusiasm, something the Seasteading Institute’s founders readily acknowledge. Indeed, they chronicle these failures in depressing detail on their website. With names like the Freedom Ship, the Aquarius Project, and Laissez-Faire City, most of these projects accomplished little more than receiving a burst of publicity (and in some cases, raising funds that were squandered) before collapsing under the weight of their inflated expectations. There are many reasons to doubt that the Seasteading Institute will realize its vision of floating cities in the sea; but there are at least two reasons to think that seasteading may prove to be more successful than past efforts to escape the grasp of the world’s governments. First, the project’s planners are pragmatic—at least by the standards of their predecessors—pursuing an incrementalist strategy and focusing primarily on solving short-term engineering problems. Second, they recently announced a half-million dollar pledge from PayPal co-founder Peter Thiel, giving them the resources to begin serious engineering and design work. While there are many obstacles to be overcome before they will have even a functioning prototype—to say nothing of a floating metropolis—their project doesn’t seem as obviously hopeless as most of the efforts that have preceded it. Ars talked to Seasteading Institute co-founder Patri Friedman about the seasteading project and the engineering and political problems it will face. Friedman describes himself as an “enthusiastic libertarian,” a description that would fit Thiel as well. Their libertarian convictions are a major source of inspiration for the seasteading project. Frustrated with the size and intrusiveness of existing governments, they view the sea as a frontier that will allow people more freedom to experiment with different ways of organizing human societies. They depict government as an industry that suffers from unreasonably high barriers to entry. At present, experimenting with a new form of government requires winning an election or starting a revolution, prohibitively expensive options for small groups. As a result, they argue, even democratic governments are insufficiently responsive to their customers, the voters. The seasteaders seek to lower barriers to entry in the government business in order to create more competition and choice. While his own convictions run in a libertarian direction, Friedman is quick to emphasize that the core value of seasteading is the diversity it would allow. Not all seasteading communities would be libertarian. For example, some seasteads might be founded by environmentalists interested in more sustainable lifestyles. Others might be owned by religious communities seeking to separate themselves from the broader society. Still others might be founded as egalitarian workers’ communes. A key advantage of seasteads is what Friedman calls “dynamic geography,” the fact that any given seasteading unit is free to join or leave larger units within seasteading communities. Seasteading platforms would likely band together to provide common services like police protection, but with the key difference that any platform that was dissatisfied with the value it was receiving from such jurisdictions could leave them at any time. He argues that this would “move power downward,” giving smaller units within society greater leverage to ensure the interests of their members are being served. Friedman founded the institute with retired Sun engineer Wayne Gramlich, who coined the term “seasteading” in an essay and who serves as the institute’s engineering director. Along with Andrew Houser, they have penned an in-depth treatise on seasteading. The book-length manifesto includes an impressive depth of technical detail, with discussion ranging from the best construction materials to the the most efficient platform geometry. After considering several options, they conclude that the best design is a “floating spar” design. Under their preferred approach, the living space is lofted several dozen feet above the surface of the water. The open ocean is an unforgiving environment, and the biggest hazard comes from waves. Ordinarily, waves on the open seas are a few feet high—small enough to pose little threat to larger boats. But under certain circumstances, waves can be as high as 100 feet, which can be difficult for even the largest ocean-going vessels to withstand. The spar platform design neatly sidesteps this difficulty by presenting only a slender concrete pillar at sea level, allowing waves to pass by largely unimpeded. The living space is hoisted high enough that waves pass harmlessly beneath it even in stormy conditions. Supporting this platform requires a large underwater system of flotation and ballast, giving the overall system a dumbbell shape. Another advantage of the small cross-sectional area at sea level is that the platform would not rock noticeably in response to waves. In order to keep costs down, the proposal uses standard building techniques, with reinforced concrete as the primary building material. Friedman and his co-authors estimate that the early prototypes could cost as little as $100,000 per occupant—expensive, but within the reach of many a Silicon Valley millionaire. Because banks are unlikely to accept seasteads as collateral, the first participants would need to be largely self-financing, requiring them to have most of that cash in the bank before they could sign up. Initially, at least, seasteading would not be an option for those of modest means. Nor would it be for people who are attached to creature comforts. Achieving the long-term goal of near-self-sufficiency will require significant lifestyle compromises. Seasteaders would have only a few hundred square feet of living space each and would have to carefully limit the water they consumed and the waste they produced. Vegetarianism would also be an advantage, as meat requires significantly more resources than fruits and vegetables and would almost certainly need to be imported. Diets might also be supplemented by fishing or aquaculture. Perhaps most painful for geeks, seasteading would require significant technological sacrifices. Power would need to be tightly conserved, and Internet connectivity would be primitive. Laying fiber optic cables would be prohibitively expensive, so seasteaders would be limited to wireless communications. Smaller seasteads might be close enough to land to employ microwave links, but the larger deep-sea platforms would be limited to satellite connections that can cost hundreds of dollars a month and currently top out at 1.5 mbps, with high latencies. Telecommuting might be an option in some cases, but weekend frag-fests with landlubbers would be out of the question. The seasteaders have amassed an impressive body of work on the practical aspects of living on the high seas. Dozens of details about the seasteading experience—food, water, power, transportation, waste disposal, household appliances, bad weather, anchors, piracy (both copyright and the real kind), barnacles, ocean currents, and much more—have been hashed out in detail and practical solutions offered. While many of the specifics would doubtless have to be revised once the first seasteaders have gained some experience, there is little doubt that most of the practical obstacles could be overcome with sufficient resources and determination. However, the project faces a fundamental constraint: whether there are enough real people willing to make the required sacrifices. The first few dozen full-time seasteaders would need to be wealthy enough to make a six-figure down payment, and skilled enough to find a significant source of income that could be pursued from the middle of the ocean, yet willing to endure the privations that come with living for weeks at a time on a cramped ocean platform. There are doubtless many moderately wealthy individuals who would be interested in taking a week-long vacation on a seastead. And the response to projects such as the Free State Project suggest that there are a significant number of libertarians who are willing to pick up roots to pursue their political ideals. But the number of people who are wealthy and willing to move thousands of miles from home to live in cramped quarters to promote their political ideals is likely to be pretty small. Friedman and his partners are counting on life in seasteading communities to grow less harsh as the communities expand. As seasteading communities grow, fixed expenses can be spread across more people, and some seasteaders can find work providing services to other seasteaders. Moreover, larger communities allow increased division of labor, which could allow seasteading communities to produce more complex manufactured goods and offer more sophisticated services. But the number of seasteaders required to create a substantial “internal market” in seasteading communities is likely to be significant—in the tens of thousands, not the hundreds. Even relatively simple manufacturing operations depend on a complex network of suppliers, employees, and distributors. This complex economic infrastructure would have to be replicated within seasteading communities before manufacturing would be viable. Providing services, such as computer programming, legal advice, or accounting, might be somewhat more feasible, since modern communications technologies allow such services to be performed over great distances. But here, too, seasteaders would face significant challenges. It is no accident that the highest-paying service professions often require frequent travel. Most clients want to meet their lawyers, accountants, and other service professionals face-to-face on a regular basis, and that requirement would be a major disadvantage for seasteaders for whom a trip to the mainland is a multi-day ordeal. Even software development, the quintessentially telecommuting-friendly occupation, tends to require face-to-face meetings between the developers and key users during the design and testing phases. Moreover, seastead-based software developers would face stiff competition from Indian developers willing to do the same work at a fraction of the cost. This isn’t to say that making a living on a seasteads would be impossible. There would surely be some viable market niches that the kind of highly skilled and ambitious people likely to try seasteading could fill. But moving to a seastead will involve an enormous economic sacrifice for the foreseeable future, even in the extremely optimistic case that several thousand people can be persuaded to sign up. Hundreds of thousands of people are likely to be needed in order to produce the degree of specialization that would be required to match the standard of living of Western nations. And ideological zeal is not going to be sufficient to attract that many inhabitants. Will governments leave seasteads alone? An even bigger challenge to successful seasteading is convincing the world’s governments to allow new members into the cartel of nations. Several recent efforts to assert the sovereignty of new nations located in international waters have been thwarted by existing countries who have shown little regard for diplomatic niceties. Past efforts to establish sovereign nations in international waters have typically faced the active opposition of nearby governments, which have either asserted jurisdiction by force of arms or destroyed the would-be nation entirely. Conscious of this danger, Friedman’s seasteaders do not plan to seek formal sovereignty for seasteading communities any time soon. Rather, Friedman prefers the term “autonomy,” and advocates a strategy of compromise with the world’s governments, seeking the maximum amount of freedom that can be obtained without invoking the wrath of the world’s navies. That means that despite their founders’ libertarian convictions, the first seasteading communities are likely to restrict activities such as drug trafficking, copyright infringement, tax evasion, and secretive financial transactions that might attract the attention of foreign governments. A seastead would also seek protection by flying a flag of convenience, a maritime custom that allows a ship to adopt the flag of a foreign country and subject itself to that country’s maritime law. Because nations compete for the revenue that comes with ship listings, a flag of convenience can be had for a few thousand dollars, and many nations exercise minimal oversight over the ships under their supervision. However, it’s unclear if this will be sufficient to protect seasteading communities from interference by world governments in the long run. The legal fiction that seasteads are ships flying the flag of a foreign country may provide adequate protection when a seastead consists of a few dozen people with no assets to speak of, but a country may not feel so generous if it is someday confronted with a seastead containing hundreds of its former citizens who are earning incomes without paying taxes on them. Such a country may begin demanding that its laws be enforced within the seastead. With no military, the community may have little choice but to comply. Seasteading seems unlikely to take the world by storm any time soon. The concept faces monumental challenges—both economic and political—and the Seasteading Institute will struggle to convince enough people to get on board to make the effort viable. However, cost is a major wildcard. The Seasteading Institute’s current estimates suggest that the first seasteaders will be required to make a commitment in the low six figures for a relatively cramped spot in a seastead. That transaction is unlikely to appeal to any but the most ardent ideologues. But it’s possible to imagine these costs coming down substantially. Cheaper and more versatile building materials could be discovered. Better solar panels, desalinization technologies, and wireless Internet connections could be developed. And with each seastead that is completed, engineers are likely to discover ways to cut costs. If viable seasteads could be built for tens, rather than hundreds, of thousands of dollars per occupant, it would open the concept to a whole new audience. Buying a spot on a seastead would be less like buying a second home (and paying for it in cash) and more likely buying an RV or a boat. It could create a thriving market for seasteads as vacation homes, which in turn would create a demand for full-time workers in the seasteading hospitality industry. As seastead technology became more advanced, seasteads would become more comfortable, and it would be easier to convince people to stay on them for longer periods. History suggests that technologies don’t have really revolutionary effects until they become cheap enough for ordinary people to buy them. Computers have been around since the 1950s and packet-switched networks have existed since the 1970s, but their really disruptive social effects—such as the emergence of peer-to-peer file sharing—came only when a computer could be had for a few hundred dollars and an Internet connection could be had for less than $50 per month. If seasteading is to have the revolutionary effects that Friedman envisions, it will require seasteads that can be made cheap enough that they are affordable to a large number of ordinary people. Friedman regards cost as the most pressing challenge facing the seasteading effort. He and Gramlich scorn past proposals that required raising billions of dollars before they could achieve the first tangible results. The half-million dollars that Thiel has pledged to the project will be used largely for design and engineering work on the initial prototype, which they’re hoping to splash down in San Francisco Bay within the next few years. Any effort to start new countries is bound to be a little bit crazy, but the Seasteading Institute’s relentless focus on overcoming practical engineering obstacles could make it more likely to leave a mark on the world than the starry-eyed utopian experiments that preceded it. from the first annual Seasteading conference, held in Burlingame California on October 10th. Several dozen conference-goers are filing into the Mendocino Room of the Embassy Suites Hotel in Burlingame, a San Francisco suburb, arming themselves with coffee and muffins as they shuffle to their seats. It’s the kind of scene that occurs daily—if not hourly—in the Bay Area, where techies and businesspeople forever squeeze into drab meeting rooms to discuss how they are going to change the world. But even by local standards, the attendees gathered here are chasing a dream so grand and exotic it makes the typical Internet confab look like an OSHA seminar. Anyone can build a game-changing social-network platform or a virtual community or a set of open APIs. But the people here want to start a nonmetaphorical revolution by creating their own independent nations. In the middle of the ocean. On prefab floating platforms. Friedman and his followers are not the first band of wide-eyed dreamers to want to build floating utopias. For decades, an assortment of romantics and whack jobs have fantasized about fleeing the oppressive strictures of modern government and creating a laissez-faire society on the high seas. Over the decades, they’ve tried everything from fortified sandbars to mammoth cruise ships. Nearly all have been disasters. But the would-be nation builders assembled here are not intimidated by that record of failure. After all, their plans are inspired by the ethos of the modern tech industry, where grand quixotic visions are as common as BlackBerrys, and they see their task not as a holy mission but as something like a startup. A couple of software engineers came up with an innovative concept, then outsourced it to a community and let the wisdom of the crowd improve on it. They scored financing from a top-tier venture capitalist and assembled a board of directors. They will be transparent, blogging their progress. If they fail—which, let’s face it, is the most likely outcome—they will do so quickly, in time-honored Valley fashion. But if they succeed, they have one hell of an exit strategy. Friedman launches into what he calls “my standard rant”—a spiel about government’s shortcomings and why they’re so hard to repair. In his eyes, government is a sclerotic monopoly that can count on high customer lock-in thanks to inertia and the lack of alternatives. “Government is an inefficient industry because it has an insane barrier to entry,” he says. “To compete with governments on existing land, you have to win a war, an election, or a revolution.” He points to the democracy that emerged from the American Revolution as the last successful rollout and attributes the subsequent dry spell to the lack of uncolonized space on the map. “We’ve run out of frontier,” he says. But there’s still one virgin realm left, and it covers 70 percent of the earth’s surface. Friedman’s optimism is easier to buy into if you ignore the history of previous would-be nation builders. There was Operation Atlantis, created by Ayn Rand admirer Werner Stiefel in the late 1960s. Stiefel, who made a fortune selling dermatology products, devoted his life to creating a sovereign society with the freest markets imaginable. He started with a ferro-cement boat that made a single successful voyage on the Hudson River. He erected a system of seabreaks near the coast of Haiti but was run off by president Franè7ois Duvalier’s gunboats before he could put land on it. He bought an oil rig and tried to anchor it between Cuba and Honduras, where it was destroyed by a storm. Stiefel died in 2006 with little more than a sporadically published newsletter to show for his efforts. In 1971, real estate millionaire and committed libertarian Michael Oliver dumped large quantities of sand on two coral reefs in the South Pacific and dubbed it the Republic of Minerva, a land with “no taxation, welfare, subsidies, or any form of economic interventionism.” Minerva was soon invaded by the nearby kingdom of Tonga, and it dissolved back into the ocean shortly thereafter. The Oceania city project, a plan for a vast floating settlement off the coast of Panama, emerged in 1993. The founders took out a two-page ad in Reason, a libertarian magazine, promising to free prospective residents from governments “entangled in bureaucracy, corruption, and the free lunch philosophy.” The project was disbanded the following year due to lack of interest and funds. “The Libertarian party is small in number and too few members have the financial resources to bankroll their beliefs,” founder Eric Klien wrote on Oceania’s Web site. Other projects still exist as hypothetical concepts. There’s the Freedom Ship, a mile-long floating tax haven, which will come into being just as soon as its organizers can drum up the $10 billion needed to build it. (They’ve accused their former president of absconding with the first $400,000 they raised.) The concept of failed aquatic libertarian havens has even entered the pop consciousness, providing the setting for the blockbuster videogame BioShock. Wayne Gramlich will never move to the middle of the ocean—his wife forbids it. But when the former software engineer, who has been “on sabbatical” since the late 1990s, stumbled across the Oceania Web site about a decade ago, he was both enthralled by the vision and dismayed at the execution. An early Sun Microsystems employee who worked on browser security at the dawn of the World Wide Web, he thought what was needed was a dispassionate perspective—a realistic plan to build floating autonomous countries. “Oceania had a lot of pretty pictures, pretty concept art, but that was it,” he says. In 1998 he wrote a modest proposal, SeaSteading—Homesteading on the High Seas, to get beyond the grandiloquence. “Big and expensive projects will have a very difficult time attracting the requisite capital,” Gramlich wrote. An engineer at heart, he tried to devise a way to build islands on the cheap. His report outlined how thousands of empty 2-liter soda bottles could be used to create a floating platform. That sounded like paradise to Friedman when he saw the paper on Gramlich’s site. He had always been interested in big-picture socioeconomic theories. The son of libertarian legal theorist David Friedman and grandson of the Nobel Prize-winning free-market economist Milton Friedman, Patri had until then expressed his worldview mainly through his lifestyle: engaging in “radical self-expression” at Burning Man, experimenting with drugs, living in intentional communities with several other families, and maintaining a polyamorous relationship with his wife. His BMW 328i has a customized license plate: FRRREAK. Gramlich and Friedman’s online tome captured the imagination of like-minded geeks, who peppered it with suggestions and criticisms. It was also brought to the attention of millionaire tech investor Peter Thiel, who shared Friedman and Gramlich’s dissatisfaction with land-bound governments. Thiel was a cofounder of PayPal, and he viewed that company as a way to further his libertarian ideals—a way to move money around the world as 1s and 0s without the involvement of nations or their currencies. After selling PayPal to eBay and walking away with a reported $55 million, Thiel started the hedge fund Clarium Capital, which made a fortune earlier this decade by correctly betting that oil prices would rise and the dollar would weaken. Thiel has invested in Facebook, Friendster, LinkedIn, and Slide. He has also donated $3.5 million to Aubrey de Grey’s Methuselah Foundation, which seeks to extend longevity, and given money to the campaigns of small-government conservatives like Ron Paul. “Peter wants to end the inevitability of death and taxes,” Friedman says. “I mean, talk about aiming high!” Last April, Thiel pledged a $500,000 investment and installed his right-hand man, Joe Lonsdale, as chair of the Seasteading Institute. “Decades from now, those looking back at the start of the century will understand that seasteading was an obvious step toward encouraging the development of more efficient, practical public-sector models around the world,” Thiel said in a statement at the time. Three months after the wire transfer went through, Friedman left his job at Google. But in the end, the seasteaders may face an even more fundamental challenge. During an afternoon session, Friedman asks, “How many people here know how to sail?” Few hands go up. He says plans are under way to offer group instruction at discount rates. The first annual seasteading conference adjourns at 6 pm. A kayaking trip around the bohemian houseboat community just off Sausalito has been scheduled for the following morning, but it is canceled because of high winds. Forbes Island isn’t really an island at all but a 5,000-square-foot, 700-ton sea vehicle decked out with palm trees, a white-sand beach, and a lighthouse. A houseboat designer named Forbes Kiddoo, inspired by the science fiction of Jules Verne, spent five years building it. In 1999, he converted it into a restaurant that today floats near San Francisco’s kitschy Pier 39, serving $35 rack of lamb to tourists who watch sea lions flop around on the nearby docks. Tonight, the eatery is hosting the Seasteading Institute’s post-conference dinner. Eventually, the seasteaders move to the Tahiti Room, which has a lovely moonlit view of Alcatraz. Chatter around the table gets louder as the wine flows, but the subject matter remains wonky. “The interesting issues are social and legal,” says Mikolaj Habryn, a site reliability engineer at Google. “You’ll get slavery. You’ll get drug dealing. Maybe there’ll be polygamous Mormons. The first people involved will inevitably be those who want to do things they can’t do on land, and we have to deal with that.” A ship passes, and even though Forbes Island is firmly moored a few hundred feet from shore and separated from the bay by a breakwater, the restaurant sways so much that some diners have to breathe deeply and focus on the horizon to settle their stomachs. The Seasteading Institute plans to gather a kind of ad-hoc flotilla, called “ephemerisle,” in the San Francisco Bay near Redwood City over the Fourth of July weekend. The plan for July 2010: find a way to hold the gathering off the coast in the Pacific Ocean. Other supporters of the project include PayPal co-founder Peter Thiel, who runs a hedge fund called Clarium Capital Management and donated $500,000 to the Seasteading Institute. Former Sun Microsystems engineer Wayne Gramlich is the group’s director of engineering; former Paypal manager James Hogan is its director of operations; Liz Lacy of now-defunct Excite@Home heads its development efforts. While their affection for seasteading has varying origins, the broadest theme is to allow people to escape overreaching governments and replace conventional political systems with something of their own creation. (A section of their Web site is titled: “Land = Crappy Government” and says that terrestrial governments do a “terrible and sometimes horrific job” at serving the taxpayers that are their customers.) Yet the Seasteading Institute’s official position is, to put it in terms that Washington politicians might employ, thoroughly nonpartisan. Once the engineering work is complete and groups can purchase, outfit, and launch their own platforms, Friedman and his colleagues predict that some of the first ‘steaders will not be nudists, recreational drug users, pacifists, environmentalists, or religious groups hoping to create an enclave far away from secular influences. One way to look at the prospect of colonizing the oceans is that it represents the continuation of a westward trend that began with Greece and continued through Rome, Gaul, Britain, and the North American continent. “When people got to California that was as far west as they could go,” said David Boaz, executive vice president of the Cato Institute, a free-market think tank in Washington, D.C. “Maybe this will turn out to be an opportunity to revive that search for a frontier.” Boaz questions whether the United States is sufficiently repressive to prompt enough people to move offshore. “In a prosperous, comfortable society, it might be hard to get people to take those kinds of risk,” he said, referring to “the risk aversion of a wealthy society.” Plus, colonizing land even at the wilderness’ edge is trivial compared with the technical and engineering challenges of colonizing the ocean. Can a floating platform weather typhoons and so-called rogue waves that can swell to more than eight stories tall? Should it be stationary or mobile? Will food be grown, harvested, or imported? And what about more prosaic matters, such as communications and waste disposal? One case study can be found in HavenCo, an Internet hosting business created nine years ago atop a windswept gun emplacement six miles off the coast of England. The rusting, basketball-court-size fortress was abandoned by the British military after using it during World War II to shoot down Nazi aircraft, and was claimed in 1967 by Roy Bates, the self-described “crown prince of Sealand.” A HavenCo executive said in 2003 that the business was failing, and the hosting service went offline last year. Meanwhile, no member of the United Nations appears to have recognized Sealand as a sovereign state, and it lies within the territorial boundary of 10 miles claimed by England. 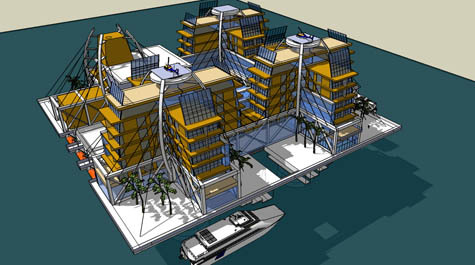 “As the adaptive reuse of an abandoned oilrig,” added John Hardy, president and CEO of the John Hardy Group, “the Rig Resort offers a potentially commercially viable solution to an environmental hazard by providing alternative adventure travel opportunities based on a natural setting, simultaneously creating new jobs previously non-existent in the area.” In addition to attracting the adventurer and luxury traveler, this destination resort will also draw conferences, business retreats, and can serve as a cruise ship’s main port of call en route to other locations in Mexico and the Caribbean. Miles from shore, the Rig Hotel will function autonomously through the use of alternative energy. Upon entering the “reef lobby,” guests enjoy spectacular views of the Gulf — including vantages through the lobby’s glass floor. Spaces are organized around a core of water that serves as ballast while also providing a deep-water venue for evening shows similar to Cirque du Soleil’s Las Vegas ‘O’.